← Job Opportunity For Husband! Nelson is a local food lovers mecca – it was easy when living there to have a diet that, while not completely a 100 mile diet, was a vast improvement over the average North American, who’s food travels about 1500 km. We eliminated citrus, and any food from outside of North Amercia – coffee accepted of course. (Its not food so much as the life blood.) It was easy in the summer to get fresh fruit and vegetables, and in the winter we tried to eat from our freezer. Locally raised lamb and chicken meant we never had to eat meat that was loaded with antibiotics and who knows what else. When we traveled to the Okanagan we stocked up at the world’s best farmers market in Armstrong, where we could even get local organic grains. In Nelson we were even able to find Canadian organic pasta, from the Prairies. And even more amazing, was our local wheat, that we could get ground, for a few cents, into fresh flour. This was thanks to a local community sponsored agriculture project, where the group paid the farmer in the spring for his crop, and shared it in the fall. This gives the farmer a secure market for trying something different, like wheat. The wheat was even delivered to Nelson, from Creston, via sailboat! It was pretty easy to do these things and the quality and taste of of our diet was greatly enhanced as well. Our move to a local, additive free diet was really spurred on by reading three books: “In Defense of Food” by Micheal Pollan was life changing for me. I’ve radically altered my diet since I read it. If you haven’t read it, you should run out and do so. Other great reads are Barbara Kingsolver’s “Animal, Vegetable, Miracle” and “The One Hundred Mile Diet” by a Vancouver couple. We knew things would change when we moved to Yellowknife. We weren’t sure what to expect, except perhaps that we should have no expectations! With no freezer, (ie no electricity to run the freezer) we can’t really store food for long. Its not all dire and bleak however. The local food co-op, while very pricy, and not in the least concerned with food locality, does have very good quality fruits and vegetables. We’ve also discovered one or two restuarunts that have great food and service, so we are lucky. There are a few notable options for locally harvested food too. Lots of berries growing wild – gooseberries and saskatoons grow right next door on Gull Island, and there are lots of wild blueberries, raspberries and cloud berries. Next year we’ll be organized enough to harvest some! Yesterday, on a ramble out in the wilderness, we found a great stand of wild cranberry bushes, loaded with gleaming red berries like precious jewels. We’ll go back and harvest them after the first frost, which could even be tonight, the way things are changing around here. Apparently cranberry picking, much like the famed Kootenay huckleberries, is a treasured, indeed mythic past time, and the locations of prime picking spots are jealously guarded. I had to trade a kidney to go along with Jan on my first huckleberry picking expedition in Nelson, and being down to just one, I”ll have to find something else to bargain with to find more local cranberries! If you’ve never had wild cranberries, you are really missing out. I used to get them in northern BC in time for Thanksgiving, but up here it really will be much earlier. However, what we are really excited about this week is our most recent bit of urban foraging. It was spontaneous, and serendipitous. After a thrilling date at the movie theater, (Nelson doesn’t have one any more, so we haven’t been to the movies for a couple of years) we took a midnight walk in the civic park across the road. Downtown central Yellowknife, that is. 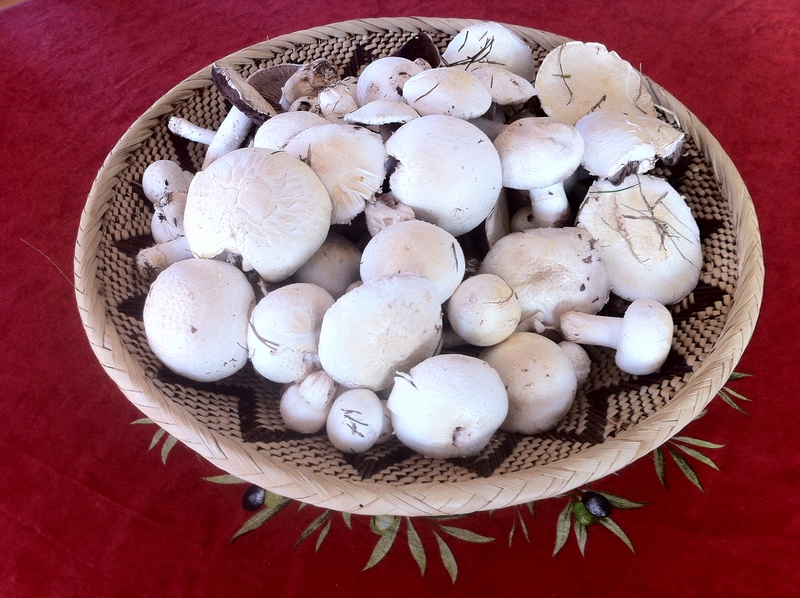 On the broad lawn in front of city hall, we found a treasure chest of meadow mushrooms. Acording to mushroom savy husband, meadow, or prince, mushrooms are one of the most desirable wild mushrooms. The look much like store bought white mushrooms, but they have a deeper, satisfying flavor. Tasty but not strong. (Disclaimer – don’t try this at home, without someone who really knows their stuff!) Imagine our delight in harvesting about 3 pounds of young,firm and perfect mushrooms! (the photo above is of the actual harvest). We filled up our bag, and then boated home across a bay of calm and quiet waters. Our way was lit by a midnight moon, a perfect half circle in the eastern sky, and the NORTHERN LIGHTS! When we looked up, the sky near the moon was filled with ghostly green light, that flickered and shifted, like a curtain of gauze in the wind. I hadn’t thought to look for them this time of year, but apparently august is a good month to see the aurora borealis. One needs to look frequently, as they dance about and can come and go quickly. Ah, midnight in the garden, when the bounty and beauty of the earth is close. As close as a caress upon the heart. This entry was posted in Food, North of 60, photos and tagged 100 mile diet, northern lights, urban harvest. Bookmark the permalink. Beautifully written Tandi…have you ever considered publishing your thoughts and observations about your new experiences and environment ? I feel privileged to enjoy your wonderful posts. Sounds amazing. I had a beautiful evening experience watching the meteor shower on Saturday, out in the field with the horses munching happily on grass. The big sky above us is an amazing thing!